Health Minister Greg Hunt has spoken out against a Greens push to legalise cannabis use, arguing it is a gateway drug to others. Many within Australia’s increasingly vocal medicinal cannabis community were elated last Friday when state and territory leaders met at the Council of Australian Governments (COAG) and agreed to a national scheme that would see patients’ waiting time for cannabis reduced from months to days. However, there is confusion around just what the COAG decision means. While politicians have met and agreed to the idea in principle, patients will still have to navigate the double-approval process via state governments and the Therapeutic Goods Administration while the faster pathway becomes a reality. President Donald Trump endorsed letting states decide how to regulate marijuana, in a major boost for the legal pot industry. Marijuana stocks surged on the news, which removed the threat posed by Sessions’s decision in January to rescind an Obama-era policy that helped states legalize recreational pot. Some fear that legalization leads to increased marijuana usage among adolescents. This fear is challenged by the observed increases in perception that marijuana is harmless, paired with stable rates of daily use over time. Barriers to access and cost might be additional factors that limit marijuana use among this group. These findings suggest that the continued use of well-designed and long-term studies can help policymakers make informed decisions about the true effect of legalization. Meghan Markle ‘s nephew is helping to farm millions of dollars worth of cannabis, according to reports. Tyler Dooley is even believed to be planning on developing a new strain of the drug to mark the royal wedding. According to reports, he will call the potent hybrid batch ‘Markle’s Sparkle’. Recreational marijuana was made legal in the US state Oregon, where Tyler lives, in 2015. Reports say Tyler is proud of being part of the industry, which remains illegal in the UK. Everyone knows millennials love marijuana. Now, a handful of polls by The Tylt back up that claim — and the numbers are staggering. In a study which polled over 6,000 millenial-aged users, 84% believe marijuana should be legalized. Six cities have agreed to contribute samples from the place where all drains congregate — their wastewater treatment plants. Toronto, Montreal, Edmonton, Alberta; Vancouver and Surrey in British Columbia; and Halifax, Nova Scotia, will participate. All told, the network would capture data on drug use from about a quarter of Canada’s total 36 million inhabitants. One undergraduate said the college’s elected welfare representatives were worried that the event could be exclusionary. “Anyone who might have negative experiences of drugs or addiction might be affected by it,” the student told The Daily Telegraph. Starting April 20, some Israeli pharmacies will begin selling medical cannabis products under a national pilot program, CTECH reports. The program, approved by the government in 2016, will see participation from 20 pharmacies as part of a broader Ministry of Health-approved expansion. Studies have shown it is 114 times less harmful than alcohol, but marijuana’s impact on adolescents’ brain development and mental health is a major concern for policy makers in debates over legalisation. Touting the benefits of ‘being present’, some parents claim marijuana helps with their job – but the facts are uncertain. Research on cannabis might offer brighter news for those dealing with it. Since medical weed has gained acceptance, it has played a critical role in managing other disorders, like borderline personality disorder. But what about when dealing with the teeter-totter of mania and depression seen in bipolar disorder? It’s an important question for both doctors and bipolar patients when they decide on treatment. Can you treat bipolar disorder with medical marijuana? Strain names like Green Crack spark a conversation about the perception of the cannabis industry in the age of legalization. 2018 is set to be the year of extending the beauty boundaries with the rise of body part specific masks for the décolletage, arms and breasts, silk cocoon finger balls that you place on your fingertips to help with exfoliation and one of the hottest ingredient trends on the radar this year, cannabis. 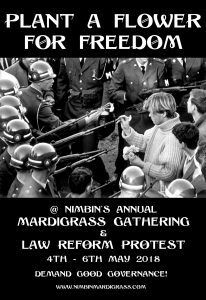 Organisers of Nimbins 26th annual MardiGrass on the weekend of May 4 – 6, say there is plenty of interest now the law is finally in question. 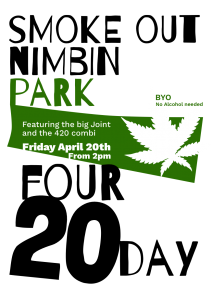 “It looks like the argument is pretty much over as to whether Cannabis is a medicine or not, it’s just about who gets to make all the money from it now,” says Michael Balderstone, president of Nimbins HEMP Embassy, chief sponsor of the annual Cannabis law reform protest and gathering.